In the Shadow of the Bear chronicles the author's return, after a forty-year absence, to the site of his childhood summer vacations at Little Glen Lake in northwestern Lower Michigan's Leelanau peninsula. The ancient Ojibwa legend that gave a name to the area's most striking geographical feature, the Sleeping Bear Sand Dunes, offers a way of understanding his mother's powerful but sometimes restless force of love and ambition in the family, as well as his father's quieter, often self-sacrificing love. Chapters devoted to the return to Leelanau, to each of his parents, and to his father's family culminate in the narrative of his daughter's 2005 Leelanau wedding. 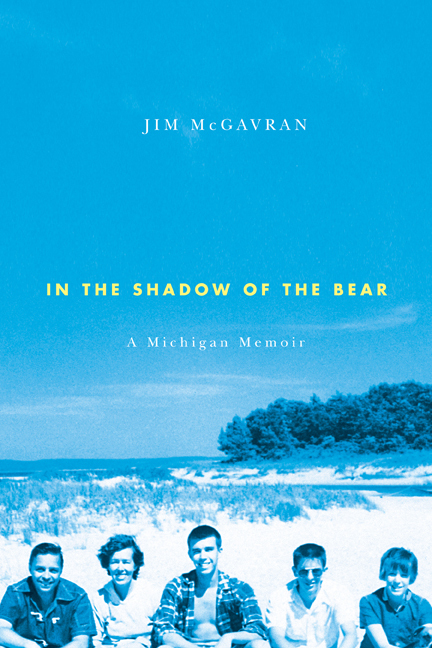 Jim McGavran tells his story of self-discovery in prose that is alternatively frank and lyrical as he recaptures his bewildered yet enchanted boyhood self, filtered through his consciousness of longing and loss, lending the writing a particular poignancy. Jim McGavran teaches English literature at the University of North Carolina at Charlotte. He is the editor of two collections of essays on romanticism and children's literature.